We already know that L’Oreal Inforcer shampoo is the best out there. But are your fragile hairs really satisfied with just that? We don’t think so. Shampoo just isn’t enough and you need a conditioner that will help your hair against breaking and will prevent hair loss, or at least will lessen it. The only conditioner for you is L’Oreal Inforcer conditioner. It will help fighting with brittle hair, even more extensively than just a shampoo would. 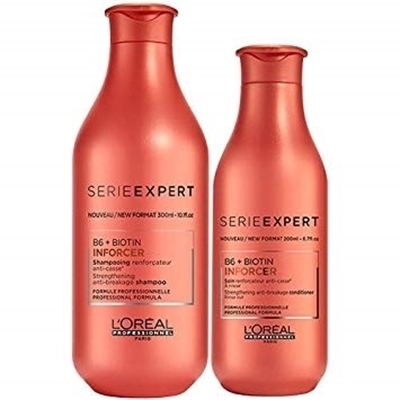 Special formula contains vitamin B6 and biotin that instantly help restoring the hair and increasing its strength, adding luster to it where there was none before. With regular use, your hair will become much stronger and healthier. Fragile hair needs love and preferably some strengthening too. We all are tired of getting those hairs out of combs and they never seem to lessen. You find hair all over the floor and it’s not even the cats. L’Oreal Inforcer shampoo is the perfect solution for fragile and weak hair that need just a push in the right direction. It effectively strengthens the hair, eliminating the brittle hair and stopping your hair from falling off of your head. Special formula contains vitamin B6 and biotin that instantly help restoring the hair and increasing its strength, adding luster to it where there was none before. With regular use, your hair will become much stronger and healthier. Black star shine factor. 125 ml. Special fluid with shining action. it`s the final touch to render hair soft, manageable and bright. Thanks to its particular formula, helps combing and gives maximum brightness to the hair. The shining effect is set off during phon drying. Suitable for every kind of hair. STAPIZ Sleek Line Styling Lotion 300 ml. Professional lotion for hair styling and modeling. It gives hair a shiny and fluffy look. It firms the coiffure and keeps it organized, giving it a subtle form. It lifts hair, but does not make it heavy or sticky, gives more volume. It contains silk proteins and styling proteins. Suitable for all kinds of hair. Long term styling effect.